Will the US and Israeli belief that a hero will suddenly appear to save the day for the Palestinians never die? Prime Minister Ehud Olmert and US President George W. Bush are in for a big disappointment. Palestinian and Arab sources say that with the scheduled return of Egypt's intelligence detail to Gaza next week, Fatah will commence discussions toward politically capitulating to Hamas. And so the US and Israeli plan to respond to the Hamas takeover of Gaza by strengthening Fatah has failed. Neither its failure, nor the US and Israeli insistence on courting failure is the least bit surprising. For the past 14 years, Washington and Jerusalem have clung to their belief that that the way to bring stability and peace to the Middle East is to establish a Fatah-dominated Palestinian state in Gaza, Judea and Samaria and parts of Jerusalem – in spite of its consistent failure. Since 1993, from blueprint to road map to vision statement to horizon vision, with a singlemindedness bordering on religious zealotry, successive Israeli governments and US administrations have advanced the idea that Fatah is the deus ex machina that will solve all the woes of the region. Both countries' apparent obsession with finding the proper way to establish a Fatah state has caused them to stubbornly ignore mountains of evidence which clearly showed that their basic assumption – that a Fatah state would engender stability and peace – was wrong. THROUGHOUT the 1990s, both countries shut their eyes as Yasser Arafat built irregular Fatah militias; enabled Hamas and Islamic Jihad to carry out suicide bombings against Israel; and transformed the Palestinian schools, mosques and media into indoctrination centers which hooked the Palestinians on jihad. In 2000 Arafat's rejection of statehood and peace at the Camp David summit exposed the fact that the Fatah-based, two-state solution was a failure. Yet both Jerusalem, under the Barak and Sharon governments, and Washington, under the Clinton and Bush administrations, refused in the intervening years to accept its failure. To the contrary: Since 2000, Israel and the US have redoubled their efforts to "strengthen Fatah" in the hopes of establishing that Palestinian state. Even as their favorite "moderates" – who at various times have included Arafat, Abbas, security chief Muhammad Dahlan, convicted mass murderer Marwan Barghouti, former PA prime minister Ahmed Qurei and current Fatah Prime Minister Salam Fayad – have all been implicated in terror attacks and funding, both Israel and the US have remained unstinting in their view. Fatah must be strengthened in order to achieve a two-state solution. STILL TODAY, in spite of Hamas's takeover of Gaza, its popularity in Judea and Samaria, and Abbas's inability to even control his own terror forces in Fatah, the Bush administration and the Olmert government are adamant: Fatah must be strengthened in order to achieve a "political horizon" that will bring about the Palestinian state. And now, by engaging in negotiations with Hamas, Fatah intends to prove them wrong yet again. And again, far from engendering peace and security, the Fatah-based policy breeds yet more instability and greater Palestinian support for terror. Given their public commitment to the Fatah-based "two-state solution," there is little hope that either US President George W. Bush or the Olmert government will accept their "vision's" failure. Yet today in both Washington and Jerusalem significant voices are calling for a reappraisal of the Fatah-based strategy. Discussions are taking place among policymakers in both capitals regarding a possible "Jordanian option." Proponents of the "Jordanian option" maintain that a Jordanian military contingent deployed to Judea and Samaria can act as a deus ex machina that will save the day for all sides. They will end the chaos on the Palestinian streets and ensure Israeli security. By doing so, it is claimed, the Jordanians will pave the way for a reform of Palestinian society which will enable negotiations to restart between Israel and the Palestinians toward a two-state solution. WHILE THOSE involved in these discussions are to be congratulated for their willingness to put aside the Fatah deus ex machina, their view of a Jordanian deus ex machina suffers from a flawed reasoning similar to that which plagues the Fatah enthusiasts. Advocates of the Jordanian military option project their own aspirations for security and a political settlement on the Jordanians without checking to see whether the Jordanians share their aspirations. And, they do not. It is true that since King Abdullah closed Hamas's offices and expelled its leaders from Jordan in 1999, the kingdom has advanced an anti-Hamas policy. But it is also true that until 1999, Jordan supported Hamas and allowed it to use Amman as its home base. Both Jordan's decision to embrace Hamas and its decision to expel Hamas stemmed from Jordan's assessment of its national interests. Unlike Israel, Jordan can, under certain circumstances, coexist with Hamas. The threat that Hamas poses to Jordan is qualitatively different from the threat it poses to Israel. And so, unlike Israel, there is no reason to believe that Jordan will not cut a deal with Hamas in Judea and Samaria that will enable the group to continue to exert control over the Palestinians and threaten Israel. A Jordanian military deployment would not merely neglect and probably harm Israel's security interests. It would also cause great harm to Israel's political interests. The deployment of Jordanian forces to the region would not mitigate international criticism of Israel as the "occupier" of the areas. And rather than forming closer political ties with Jordan, the Palestinians would continue to view attacking Israel as the best way to advance politically. 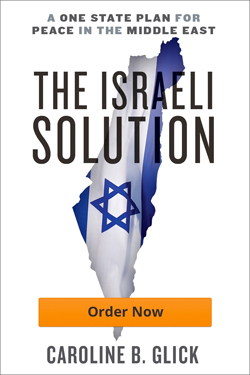 WHAT BOTH the Fatah road map to the two-state solution and the Jordanian road map to the two-state solution show quite clearly is that there is no two-state solution. Rather than search endlessly for new blueprints and horizons, both Israel and the US would do well to ask themselves the basic question of what their interests are vis-a-vis the Palestinians. Both Israel and the US would likely agree that they are interested in stabilizing the security situation in the Palestinian areas – first and foremost in Judea and Samaria to prevent Hamas from extending its reach to the Jordan River. Aside from that, both Israel and the US would agree that Palestinian society must transform itself from the jihad-supporting polity it is at present to an anti-jihadist polity. If it shows anything, the failure of the Fatah paradigm should show that all the best wishes and efforts of Israel and the US cannot cause the Palestinians to change course. They themselves have to be brought to a point where, over time, they will perhaps decide that they have taken a wrong course. TODAY, for all the talk of bringing in the Jordanian army, the fact of the matter is that the security situation in Judea and Samaria is the only good news in town. Since the IDF reasserted its control over the areas in 2002 during Operation Defensive Shield, the Israeli military has managed to largely prevent the Palestinians from rebuilding terror infrastructures capable of carrying out major or sustained attacks against Israel. Since Israeli military control is the only strategic asset to be found, it is the only thing that should be left untouched. state and ever more devoted to the cause of its destruction. It will no doubt take a generation to disabuse the Palestinians of this belief. And as long as this belief informs the Palestinians, there is no chance of ever reaching a political accommodation between them and Israel. SO RATHER than seeking to appease the Palestinians into accepting statehood, Israel and the US must set the course for an internal Palestinian reckoning with what they have become. To this end, the most Israel can responsibly offer the Palestinians is civilian autonomy with no military component. This state of affairs must last until the Palestinians themselves have proven, through their actions, that they have kicked their addiction to jihad. If thoughts now turn to Jordan, it is in the realm of political transformation and not in military affairs, where Jordan can make a major contribution to stability that can pave the way to a future peace. From 1950-1988, all Palestinian residents of Judea and Samaria were also Jordanian citizens. For the first time since King Hussein revoked their citizenship rights, today there appears to be a willingness among members of Jordan's ruling class to engage in discussion toward reinstating them. Today people like former Jordanian prime minister Abdul Salim al-Majali are quietly engaging in discussions with the Israeli and American policy communities about the possibility of reasserting Jordanian political responsibility for the Palestinians. Although these discussions are couched in the rhetoric of an Israeli withdrawal from the entirety of Judea and Samaria, there is no reason to believe that opening offers will also be closing offers. While the Olmert government and the Bush administration seem intent on ignoring them, there are viable options for securing the Palestinian front and preventing a jihadist takeover of Judea and Samaria. But to move toward them, fantasies of Fatah forces or Jordanian forces marching in to save the day and move us to a fantasyland of two-state solutions must be discarded in favor of real options based on real interests. Originally pubished in The Jerusalem Post.